Happy Holiday Season from Le VPN! Enjoy our Holiday Offer! Le VPN team wishes you Happy Holidays and an Amazing Year to come! We have a special offer for you to celebrate this festive season: Get 2 years of internet security, privacy, and online freedom for only $2.90 per month. 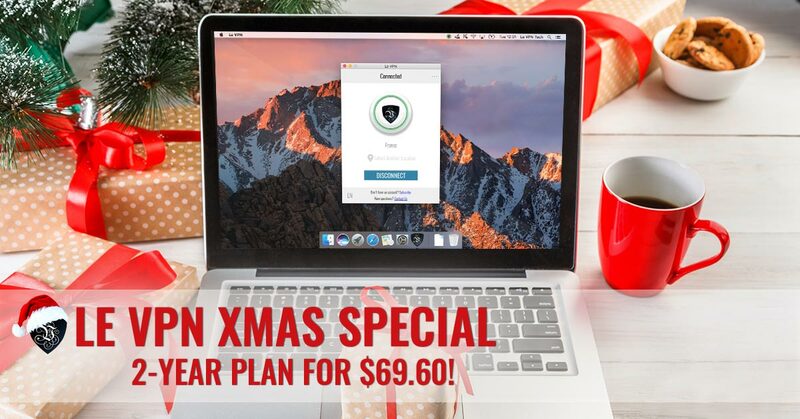 Grab our special holiday offer: 2 years of Le VPN for $69.60! Le VPN services will be even more necessary during this holiday season and will give you a lot of benefits and flexibility, enabling you to be secure anywhere you access the Internet from and to save money. If you want to stay securely connected while traveling and using a public or unknown wifi network, then Le VPN will be a great asset, maximizing your Internet security anywhere you go with your mobile device or computer. If you are traveling to a censored country during your holidays, Le VPN shall enable you to bypass censorship and be able to access the websites of your choice. If you need to travel far or if your beloved ones are away during this holiday season, you can change your IP address through Le VPN servers in 114 countries! This will enable you to speak to friends and family abroad through Skype at a local cost by changing your IP to the IP of the country where you are calling. Last but not least, you will be able to watch different holiday programs from all over the world! Thanks to Le VPN, you will bypass proxy so as to see how people are enjoying Christmas around the world, making the best of all media programs offered during this festive season. Still looking for presents for your friends and family? What can be better than a full year of online security & privacy?! And with our holiday offer, you can get not just one year, but two! Save up to 70% with our special discount on Le VPN 2-year offer during this holiday season only! Don’t wait to enjoy this great promotion! Happy Holidays from Le VPN!